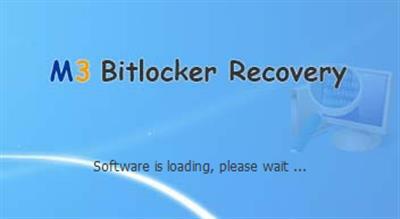 M3 Bitlocker Recovery provides safe, fast and total recovery. M3 Bitlocker Recovery, safe and effective Windows data recovery software for Bitlocker encrypted drive, retrieves your lost videos, photos, music, documents, emails, etc. from your PC's hard drive as well as from USB drives, external hard drives, SD card, CF card, memory card and other storage media. вЂў Recover deleted files from Bitlocker encrypted drive. вЂў Recover formatted data from Bitlocker encrypted drive. вЂў Recover data lost due to the damaged meta data of Bitlocker encrypted drive and Windows decryption failure. вЂў Recover data from Bitlocker encrypted drive when you forgot the password. вЂў Recover lost data from Bitlocker encrypted drive when the encryption process is accidentally terminated. вЂў Recover data from not accessed Bitlocker encrypted drive due to disk I/O error. вЂў Recover lost data from Bitlocker encrypted drive when file system is damaged, such as RAW partition, RAW file system. вЂў 100% safe. This Windows data recovery program works without any damage to your data. вЂў Preview before Recovery: Preview Common file formats, including BMP, GIF, PNG, JPEG, JPG, TXT, etc. вЂў Easy to Use: Retrieve data within only 3 simple steps and no prior recovery experience required. The friendly Wizard Mode recovery enables beginners to recover lost files by answering only two questions.